The Omron NE-C801 delivers powerful performance and shortened treatment times, with the help of their exclusive Virtual Valve Technology. 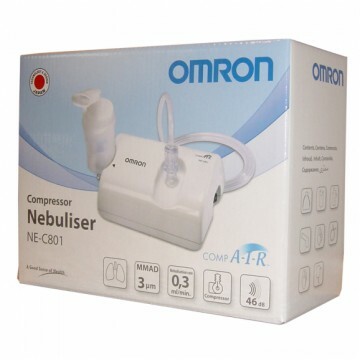 The NE-C801 nebulizes medication to a particle size of 5 microns and has a convenient angled delivery that lets you recline comfortably during treatment. Patented pump ensures long life and quiet operation. Compact design makes transportation easier than ever and it weighs less than 10 ounces. Safe and easy to clean nebulizer kit.